Back to a bit of modeling. This time even smaller than the last one - the main feature is going on a board 58" x 15" x 4" (lwh) with a small yet to be built fiddle-yard. My usual construction for the baseboard, 12mm Baltic birch frame, glued, and a 12mm Baltic ply screwed top. Cross-braces on 14.5" centers drilled for wires. The board was recycled from the last build. The plan calls for a small fiddle-yard some 6" wide and 2.48 feet long at one end. These dimensions may seem odd but the main board fits on the shelf as a shunting puzzle, and the main plus fiddle boards come to a total of 7.25 square feet. For those following my various meanderings this meets the "Scale 4 Square Feet" competition I'm developing (4 square feet in HO, in On30 this comes to 7.25 square feet)., I could use cassettes, but I'll stick to 2 tracks on the fiddle board. This is my first ever try at a turntable, measuring my locomotive stock most of it fits comfortably on a 7" diameter one (and those that don't may find their tender reduced to a "shorty" version, or even a bunker!). A 7.25" diameter hole was duly cut out of one end, I used a jig saw for the rough cut, the Dremel on a string with an end mill followed by sanding drums to get it to 7.25" ± a bit (0.05"ish). No wonder home built turntables are like hen's teeth! That gives me 1/8" to play with for the wall. The depth is a scale 3.25' (21mm). The substantial floor was built from odd bits of 12mm Baltic ply glued and screwed, that should keep things stable. The 2" square plate type Lazy Susan bearing came this week (the smallest I could find, not bad for $4.50 post-free from Hong Kong and it is rated for 30lb), so that will be the first build. 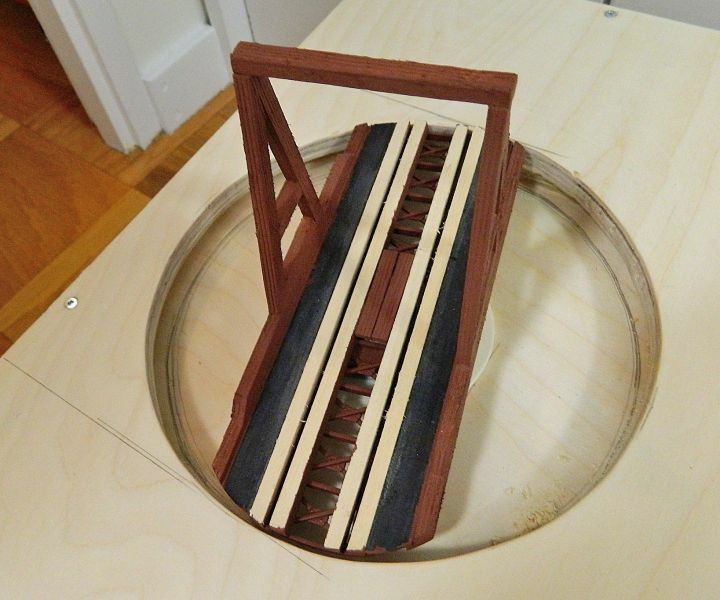 A Gallows-type wooden bridge should fit nicely on the 2" plate. Still exploring the electrical connections, I still like the idea of a slip ring arrangement and an automatic polarity reverser. Ideal for a Gallows turnout, where the bridge ran on a spider wheel and bearing system in the middle. The track plan (based loosely on a prototype terminus on an island) calls for a wye and a 3-way turnout, as well as #4 frog regular turnouts. The jig for those came last week, that should help with those pesky frog angles and blade points. Plans for symmetrical 3-way turnouts are far and few, I have a Peco code 100 one for reference (and maybe even conversion to On30, we'll see). Space is tight (just like the prototype) so keeping the turnouts short is a priority. Must remember to have a stub turnout as well. 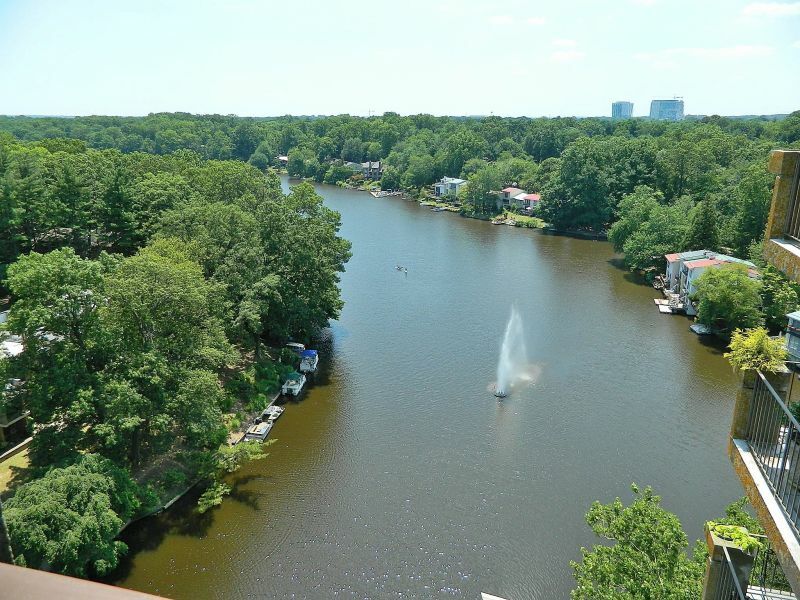 Pictures of the board with hole below, plus one of the lake from the balcony workshop. A very comfortable 87.5°F today with a bit of a breeze (31°C, it was up to 37°C earlier in the week). Progress will unfortunately be quite slow, 2-3 hours a week for the moment until the pinkies get working properly. I have a deadline of October 2018 for this one, fingers crossed. Ouch! Not yet lad, doc's orders. Almost a month since the last post, that has to be a record for one of my projects. Pinkies back in the pink at last (so to speak), so a start was made on building the turntable. I am building an A-frame gallows wood turntable (so called because the side frames are an A), more often associated with the 19th century, but examples were still being built or refurbished in the 1930's for both standard and narrow gauge lines where the expense of a full-blown steel one was not justified, and where there was not enough land for a wye turnaround. 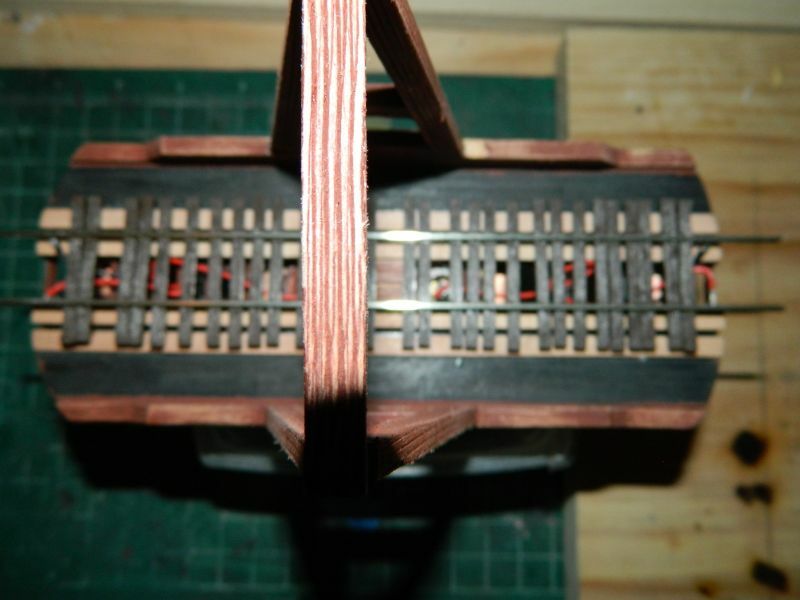 I used an old Roco HO plastic girder bridge (2 for $5 at the white elephant stall) as the sub-frame, cut down to 7" diameter (length of the longest locomotive), to which were attached bass-wood timbers aged with a hacksaw blade. Usual CAD approach (cardboard-assisted design) for the framing. Currently in red oxide primer, it needs some NBWs (nuts, bolts washers, lots and lots actually) and some stay wires and turnbuckle tensioners. The pivot support is an M12 x 3.5" bolt, epoxied to the frame, and I am using a 2" square bearing (a Lazy Susan bearing) rated for 30 lbs. Sold as having a 1/2" diameter hole, it's actually a 12mm-sized metric hole. 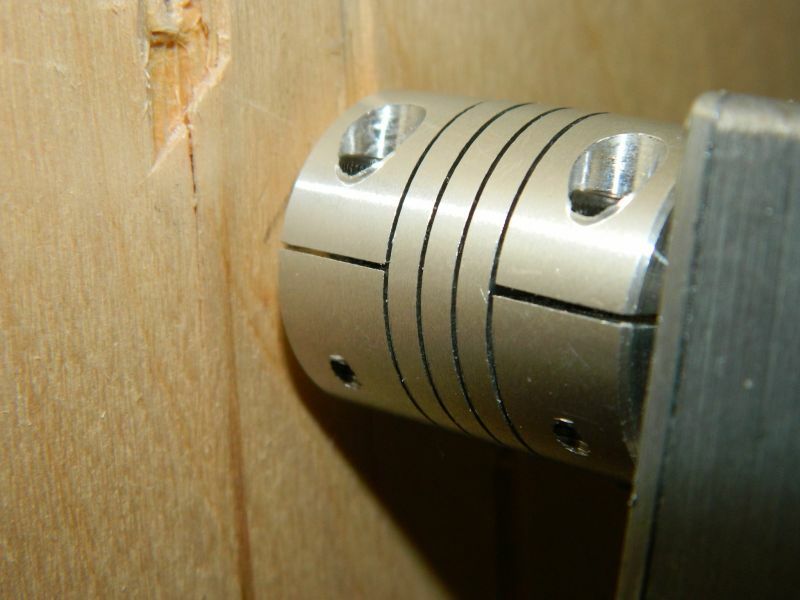 There is a brass sleeve through the baseboard floor (1/2" diameter) to keep things traight and to act as a secondary bearing.. That's one side of the electrickery, the other will be through the rail and support wheels inside the well. Bare wood is for the track timbers to be glued to. Black styrene sides will be covered with planking. 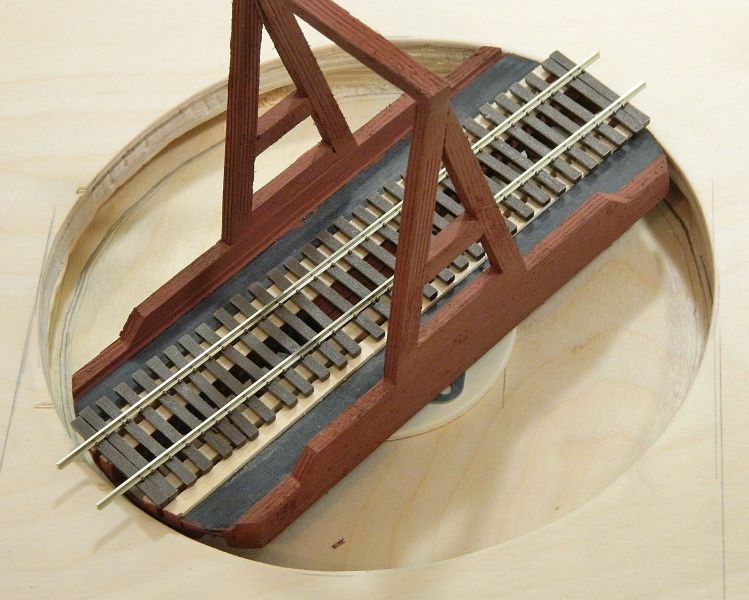 I'm using code 83 On30 narrow gauge track from Micro-Engineering. I measured thrice and drilled once, still not quite concentric but the table goes around without fouling the sides. Closenuff yelled Blodgitt and Fudgitt as they downed tools and headed for the winebar. The well wall is the next job on the list. Give them a couple of days, their vertical tastings usually end up horizontal. More updates as the build progresses. Very ambitious and coming on well. Going to look brilliant once it’s finished. Thanks. Ambitious is an understatement. 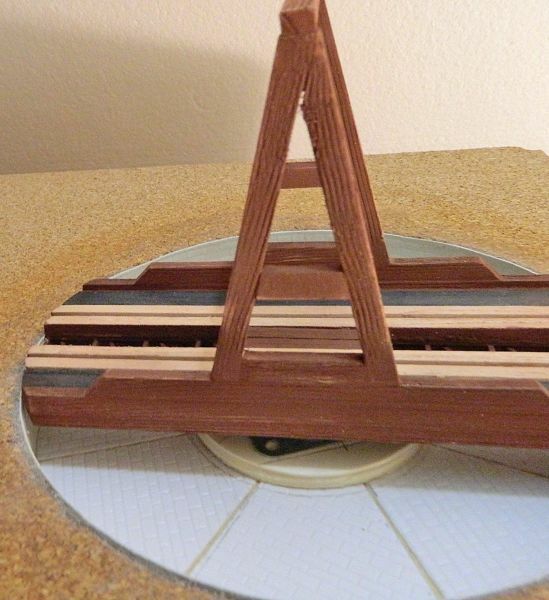 I knew DIY turntables were challenging, especially bridge ones. Happy with it so far, with the exception of the bearing and bolt it is all from the odds and ends and "what did I buy this for?" box. Total to date is less than $7.00. The motor and control will be a bit more. Total budget estimate is $50.00, On track. The polarity switcher (such as a frog juicer) will probably stretch that a bit. 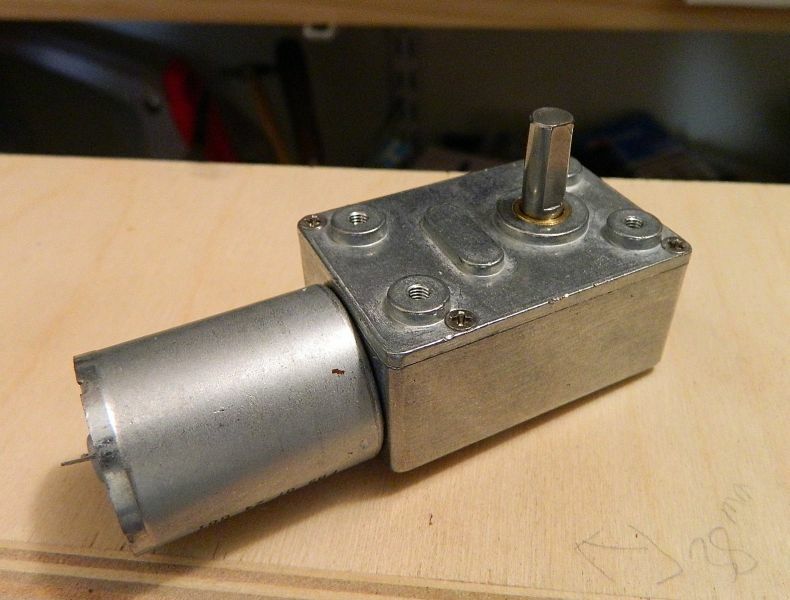 A trawl through the internet last came up with a right-angled gear head DC motor, 12v, 2 rpm (and less with less voltage), 6mm shaft, along with a 6mm to 12mm adapter. I was tempted to do a PWM controller for it to keep the torque up using a Roger Amos circuit plan, but I can get one RTR for not much more than the cost of the bits (most of which have to be bought in a minimum of 10). Set it running, enough time to make a cuppa. Game on! I didn't mention Zat Zee tunnel portal will he at the other end of the Board. Went shopping today - I decided on a 2 rpm at 12v DC right-angled gear head motor with 6 mm shaft, an attachment bracket, a DC PWM controller for the motor (CW and CCW), and a 6mm to 12mm flex shaft (all Amazon, pretty much the same price as eebuygum and mostly the same suppliers but returns are free for Amazon Prime members). 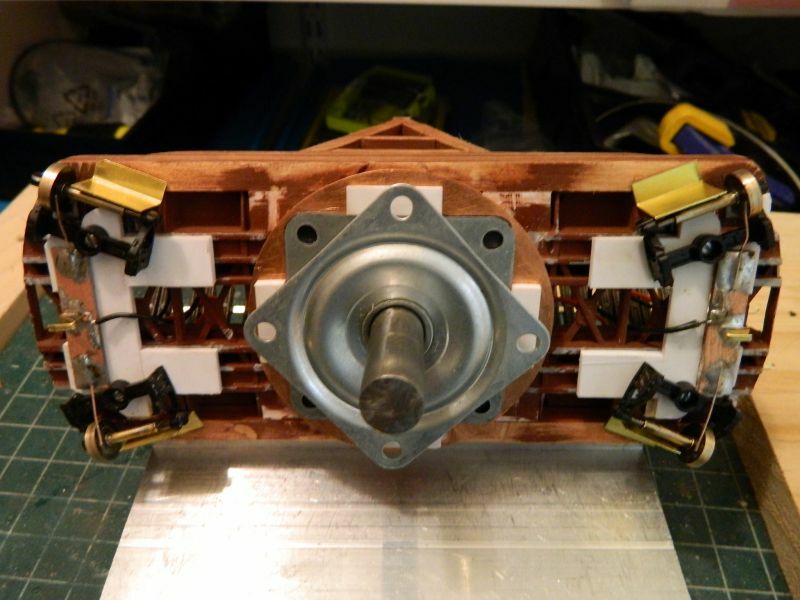 Using a right-angled design will keep the motor and gear head parallel to the baseboard top, rather than the motor sticking sticking down (which I've seen a lot of in my research) and just waiting to be thwacked by the nearest inanimate object. Have to think about some torque bars as well..
Plus some turnbuckles, 0.032" wire for same, and some cosmetic nuts, bolts and washers for the wood (Tichy Train Group, which turned out cheaper from the manufacturer than from third-party suppliers on eebuygum - always pays to check). All that lot should be here soon (Amazon says tomorrow or next week), so while I'm waiting I will have a look at the interior wall of the well and the bottom. Should have some suitable thin styrene sheet bricks somewhere. Plus some cork on the top of the baseboard. I'm using IKEA place setting mats these days, comes in flat packs of 4 and is a lot cheaper than cork in rolls - total length of a pack is 5.5' x 1' for $4.99.. LEGO bricks may get put to use as the support for the rail around the circumference. Which reminds me, where is the rail bender? I got around to the well sides and most of the bottom last night, bits of scrap plastic from the spares box. Silicone sealant used to fill in any gaps twixt cork and wall. Needs some capping blocks around the periphery at the top. The gaps on the floor of the well are for weeds/grass growing through the concrete between the brick sections. Next job after this is to calculate and measure (lots of times) the height required for the track base around the perimeter. I found the track bending jig, fingers crossed it will handle a ~6.5" diameter circle, and code 100 track. I need some half-insulated metal wheel and axle sets for the bridge support pick-ups, everything I have turns out to be fully insulated. Regular NA wheel-sets usually have metal wheels/plastic axles, I'll see whether I can switch them for some brass axles.If not it's a set of Reboxx ones ($$$). I'd prefer to have axle pick-up, but I could use wipers on the wheel rims if necessary (or even the wheel treads, old-school style). Coming on very nicely Baldrick! As Chris said, an ambitious project but you do seem to be conquering it. I admire your accuracy in cutting the well with a jigsaw, Dremel and sanding drums. If I'd attempted something like that, it would have ended up looking like a lunar orbit !!! p.s. Nice view from your workshop. The answer is screws and Newton (gravity, not apples). The bottom is fixed to the well floor through the disc (which will be the concrete pillar) with a couple of screws, bit of slop, as the brass tube through the floor is what keeps it vertical. 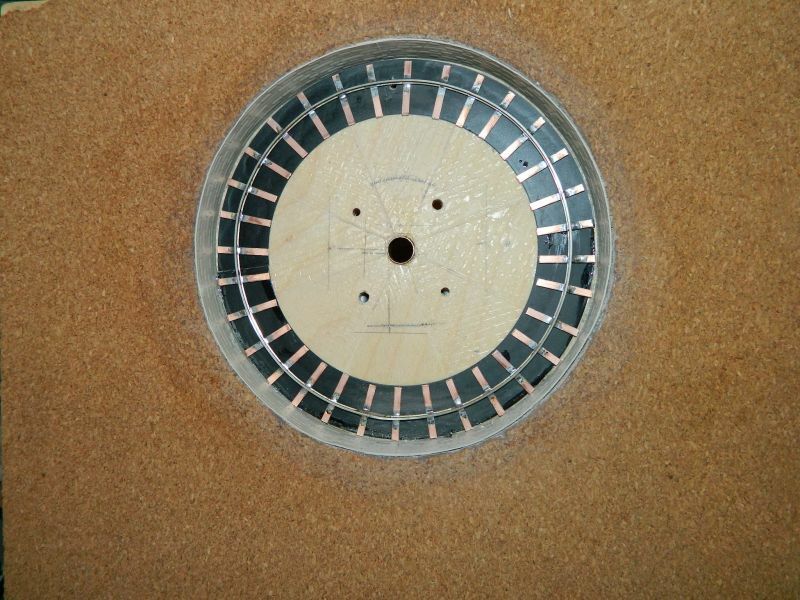 The top plate underneath the bridge will have 4 pegs that will simply drop through the holes of the top plate of the Lazy Susan bearing, this is simply to locate the bridge. The weight of the bridge and the motor (it's a weighty piece of kit) and some torque bars and flexible connectors through the fixing plate underneath will keep everything in place. That way it can be taken apart to get at the innards by disconnecting the motor and lifting it out. Turns (spins actually) without any resistance with one finger, I had to remove a tad off the ends of the bridge as the well is not 100% concentric. It's out by around 0.5mm on a nominal radius of 181mm. Not bad for a jigsaw and the Dremel on the balcony. Router wouldn't be much better. The last photo shows the beams glued in place waiting for the wheels to be attached. I finally found some spare solid passenger car wheels with brass axles (36" diameter in HO, 10.5mm actual), so I am simply going to short the wheels to the axle with a bit of phosphor bronze wire and solder, and use a wired pickup wiper on the axles. KISS applies here. Easier than trying to construct wiper pickups on the inside of the wheels. 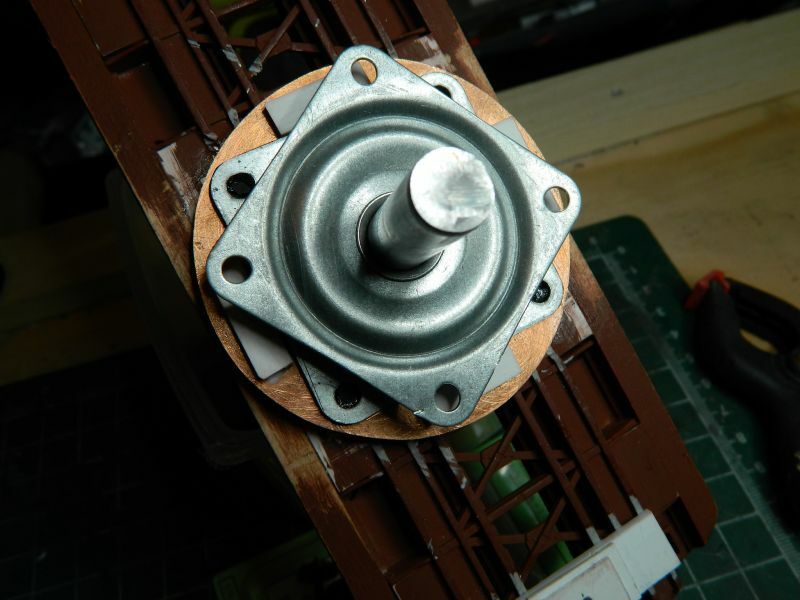 All the wheels (2 at either end of the bridge) will have pick-ups,so continuity shouldn't be a problem, and as previously mentioned I'll use the center bolt with a wiper as the other electrical contact.The flexible connector will keep it isolated from the gearbox. I tested the motor yesterday using plain vanilla DC, 2 rpm at 12v, 1 rpm at 6v, start voltage at around 3v. Tons of torque and very quiet. Nice. I'm interested in seeing what that 12v PWM controller will do. This still needs a 12v input though, I have a spare controller that will handle that.Test fit showed that it will all be out of the way underneath the sides of the module. Needs a small control panel to go on the side for the on/off direction switch and speed control knob. Thanks for the explanation Nigel. They are super smooth and so very cheap. I think I paid £4 sterling for mine and I'd guess it's around 6 inches square. Purchased with the intention of building a spray painting turntable but as I said, I couldn't work out how I was going to screw the top deck onto it .......................maybe counter-sunk machine screws with nuts underneath, but there isn't much room between top and bottom spinners. That motor look neat - and strong too. This turntable now rests "Chez Moi" and formed the centrepiece of my shed area on Maxmill - or would have done if the layout had been developed further. Lego rules! I had seen it. Linear actuators are dirt cheap now and have the motor built in. 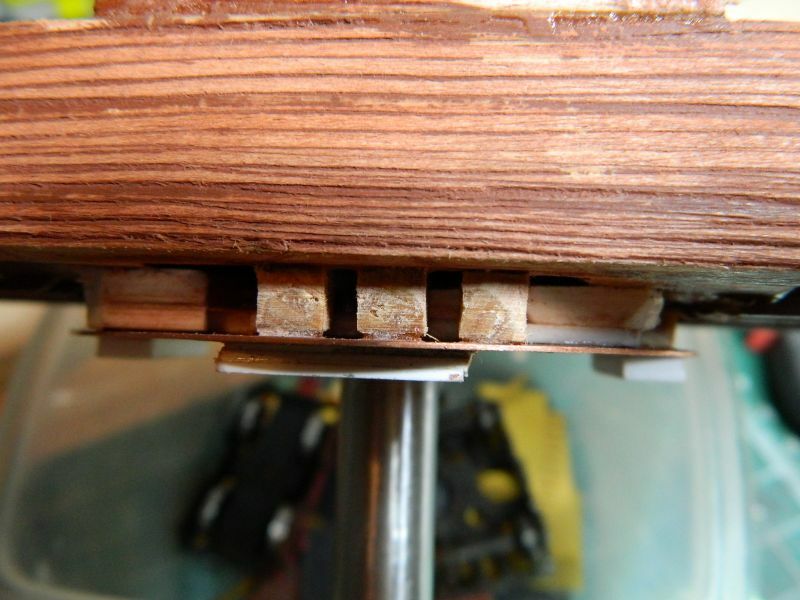 There is just enough room on rectangular Lazy Susan bearings to screw down or up. There is enough room for a nut, hold in place with a touch of CA, loctite after the bolt has been threaded. Bit more work on the turntable, plus a test run! I modified the build a bit to allow an isolated pick-up on the shaft end, rather than use the shaft as one terminal and the rail wheels as the other for the power connections. Wheel pick-ups next I think. First photograph shows the various bits. 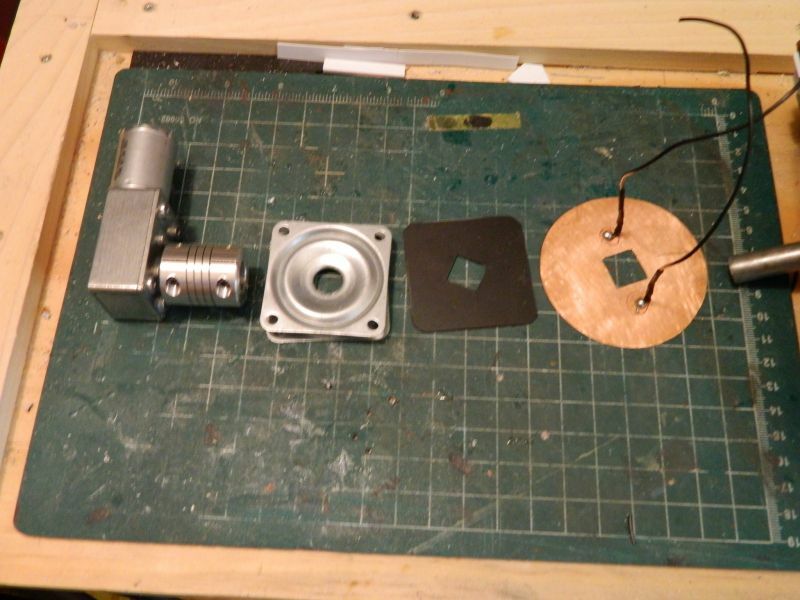 Left to right: 2 rpm gear head motor and aluminum (aluminium for the ROW) flexible adapter shaft (6mm to 12mm): Lazy Susan bearing; insulating styrene plate; copper pickup disc with soldered wires to one of the rails; end of turntable bridge shaft (that M12 bolt with the threaded end cut off using the Dremel and a heavy duty cut-off disc). Next photo shows the various bits loosely assembled on the underside of the bridge.The idea is that there will be a couple of wipers fixed to the floor of the well and bearing on the edge of the disc, the whole arrangement to be behind a "concrete" wall in the well of the turntable. 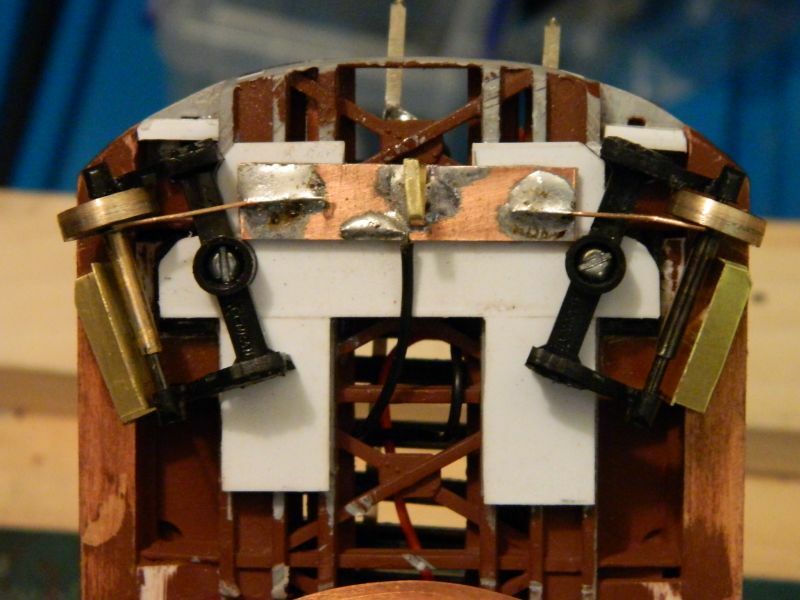 Next photo is the topside showing the 2 wires that will be soldered to one of the rails (belt and braces approach). 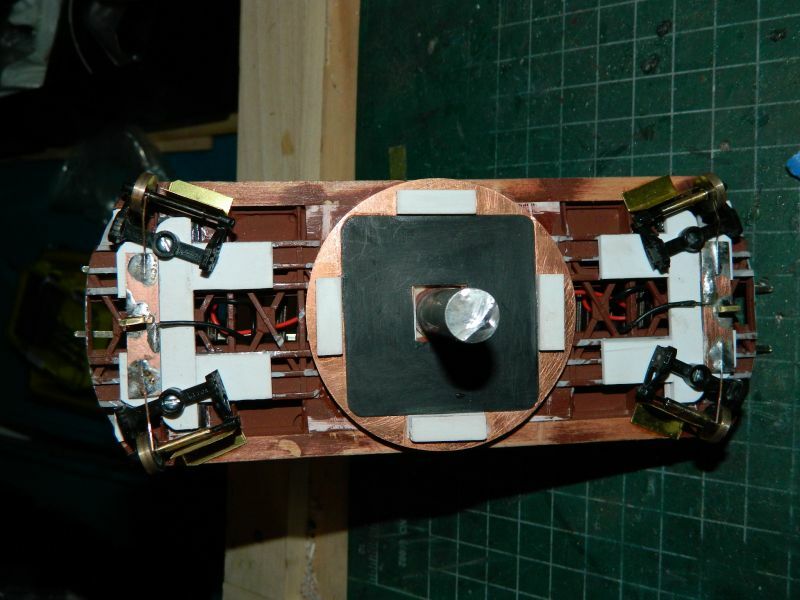 Next photo shows the motor and flexible adapter shaft attached underneath the baseboard. I have yet to put a bracket and torque bars in. One issue I have found with this low rpm/high torque motor is that torque bars will be essential to keep the shaft vertical. Last photo is the aluminum adapter between the motor and turntable shaft. Ingenious design, those groves are actually a spiral, there is around 2mm flex from the vertical. 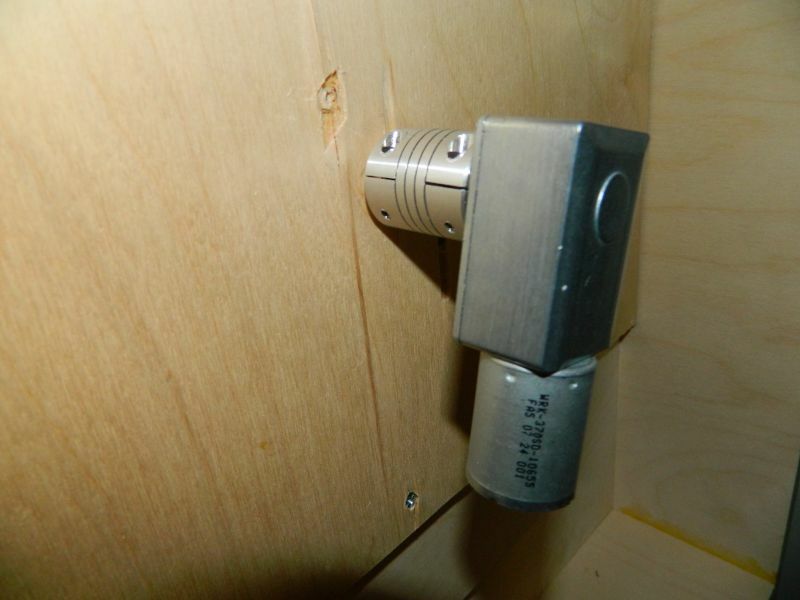 Compression and lock screws. Neat. And finally for those who like watching paint dry or grass grow, a You Tube video of the turntable moving at around 0.5 rpm (around 4v). Test fit of the parts only at this point, no rail or wheels, you can see why adequate torque control is crucial from the angle of the shaft. Should be better with the Lazy Susan bearing in place. Really like the description... 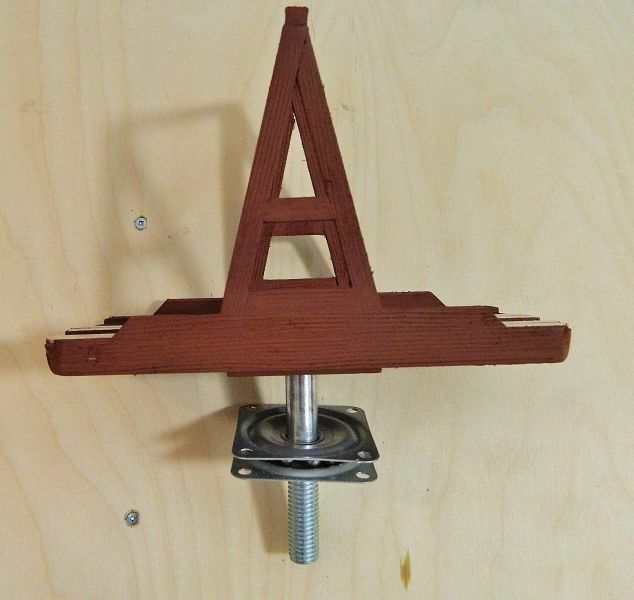 I need to remake my own with a gear wheel to get it motorised so a bit of good info there! All I have to do is get around to it! Out of interest, what prototype are you following? A few years ago, we were in Mossman in North Queensland and I took a number of photos of the sugar cane operation there which may be of interest to you. I must admit because of the length of the sugar season I never thought I would ever be up that part of the world when the trains were running! If you would like copies, let me know! Thanks. One reason I went with a gear head motor and direct drive was to avoid all the messing about with the separate gear trains necessary to reduce the motor rpm to something that looks reasonably realistic for a turntable. I have got it down to 0.25 rpm at around 3v (just on the limit for the motor), and that was without the PWM controller wired in. Bit of judder as I suspect the motor was cogging at this point. It will be interesting to see what it does with the controller. You can get this motor geared at 0.65 rpm at 12 volts, I might just get one. 10 minutes to turn a locomotive? I'm going to copy your mechanism when I re-start Maxmill 2 Nigel - I love that slow yet steady turning with, as you say, plenty of torque. . Some more work on the turntable after a much needed break down south last week (Tennessee, Georgia, Alabama). I changed the connections to the pickup disc from soldered cable to soldered brass L brackets with a hole for the wires to be soldered in place. That should make it a bit easier to dismantle if necessary. 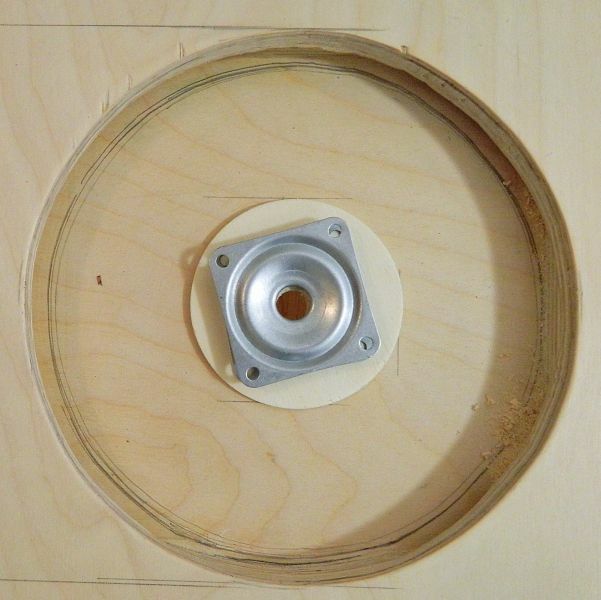 I also added some brackets to hold the upper Lazy Susan bearing in place on the pickup disc. 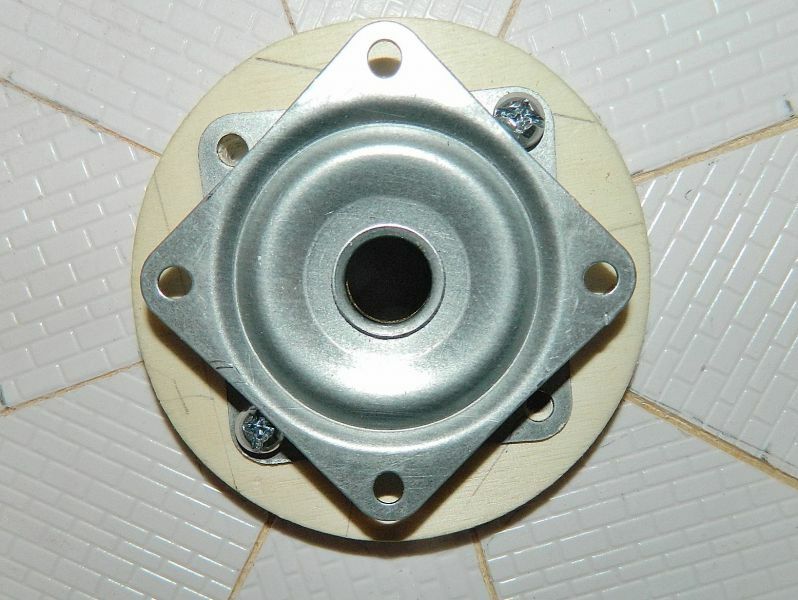 The idea is to screw the bottom plate to the floor of the turntable well, then drop the bridge in place locating the upper plate within the brackets. 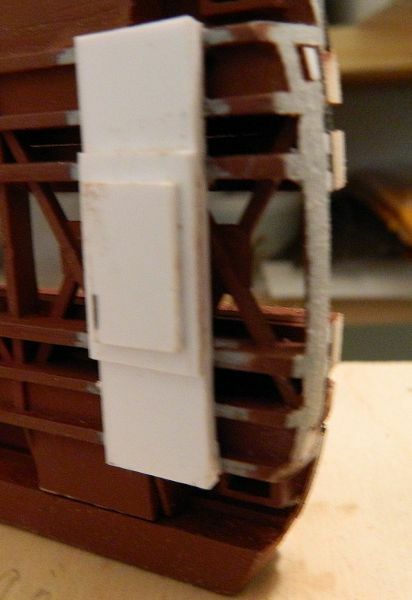 All the rotational torque is taken up by the shaft, so the CA-glued styrene strips should be OK. If not I can install some self-tapping screws. I also added some cosmetic wood under-frames that are typically found in the middle of these turntables. I also rubbed down the red oxide primer in preparation for a wash with greys. I was going to start the bridge wheels and rails today, however some prototype turntables I saw last week may mean additional work. See my post on the Tennessee Valley Railroad Museum. I think I'll get the cables, turnbuckles and NBWs in place while I mull that one over. Interesting challenge, a turntable. And one of those times when I am definitely making it up and changing where necessary as the build progresses. First photo shows the soldered L brackets in place. Made from brass strip, drilled and folded, then soldered to the copper plate. I had to use the 60w iron and the chisel blade to get the solder to flow properly. One of those times when a resistance iron would have been useful. Next photo shows the bracket hole ready for wiring and soldering. Next photo shows the locating brackets for the upper plate of the bearing in place on the lower side of the disc (which is glued to the underside of the bridge after the upper brackets were soldered in place). 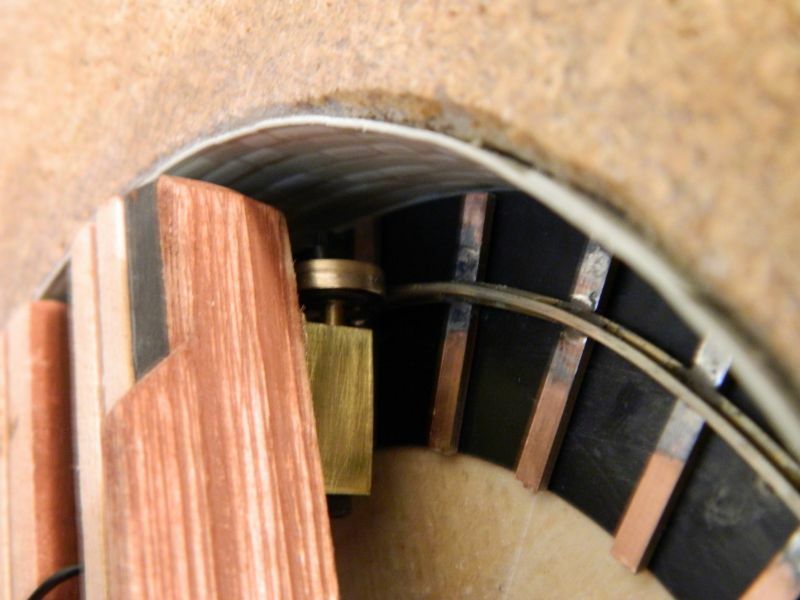 Note the insulating gap between the copper disc and the bridge shaft, which will allow use of the shaft as a conductor for the other rail if I decide to go that route. The next photo shows the bearing in place with the upper plate located between the brackets. The black showing through the holes is the styrene insulating sheet (glued in place) between the plate and the disc. Electrical continuity (actually lack thereof) is being checked as the build progresses. I could if required use the shaft for the other electrical pickup (drill and tap a screw in the head for a brass washer and wire), but that would mean turning an insulating connector between the shaft and the flexible bushing to the gearbox or using a thin-walled styrene tube of 6mm internal diameter or even heat shrink on the gearbox shaft. I'll stick with the rail and wheels for the moment. That may change if I decide to go with non-conductive cosmetic wheels. Last photo shows the cosmetic wood framing under the central part of the bridge. Glued in place with gap-filling CA. Wow that looks unbelievably complicated! I also not going to pretend to understand it all! Really looking forwards to seeing it working. Thanks. That's the wonderful world of turntables. It is actually not very complicated. Apart from the fact it needs to go around really slowly, hence that gear head drive system, there are 2 electrical systems that have to be kept separate: the turntable drive (DC in this case although there is no reason why it couldn't be DCC with a decoder), and the locomotive power (DCC in this case). Add to that a means of providing power to the rails while it is rotating. Plus a means of switching track polarity while the locomotive is on the bridge. And in the case of DCC sound not interrupting the music. DC polarity switching would of course be much easier. I'm learning as it progresses, hence the changes and revisions, but it helps to break it down into the various "modules". I have also made sure it can be taken apart easily if any of the parts needs attention. Part of the challenge has been cost, surprisingly it looks like it will be around $70-$100 US all in, depending on whether I ever go for DCC control of the motor. Most of the bridge bits are from the spares boxes. The electrickery parts are all from Amazon vendors (Amazon Prime gets free postage and returns). The really hard part is working out how to get the crew pushing the table bridge around with their legs moving. That has me stumped. Some more progress on the turntable. Track. Circle of rail made from code 100 rail and copper clad ties. Only around 6.25" in diameter, it needed 2 attempts to get it right. 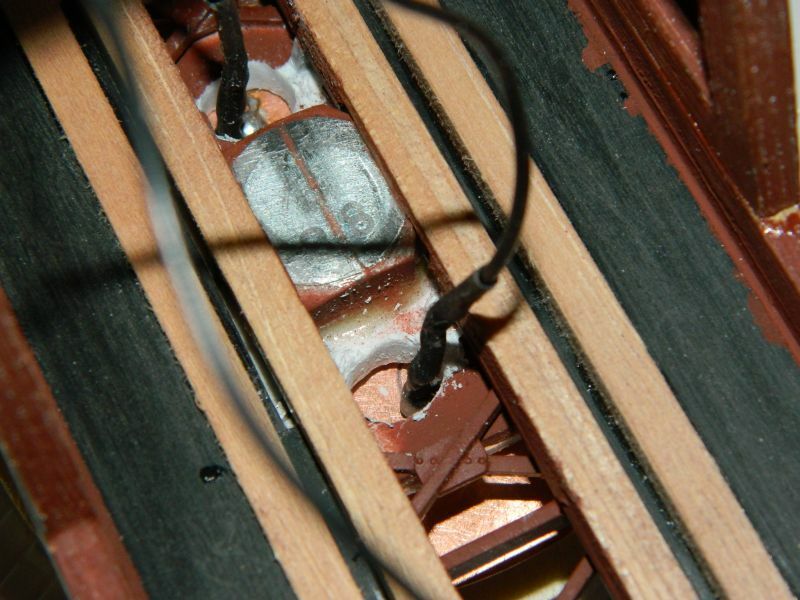 Two feeder wires to the rail, passed through the floor of the turntable well. Wheels. I used HO freight car wheel sets. One wheel was removed from the each axle, and the remaining wheels were turned down on the lathe to remove the rim and get the tread flat. I used half an HO freight car truck (bogie) for each wheel/axle, mounted on a styrene sub-frame.Bit of wiggle room to allow for centering of the wheel tread on the rail.The axles are hidden (mostly) by the bits of brass glued to the underside of the bridge. I will add a few rivets when primed. 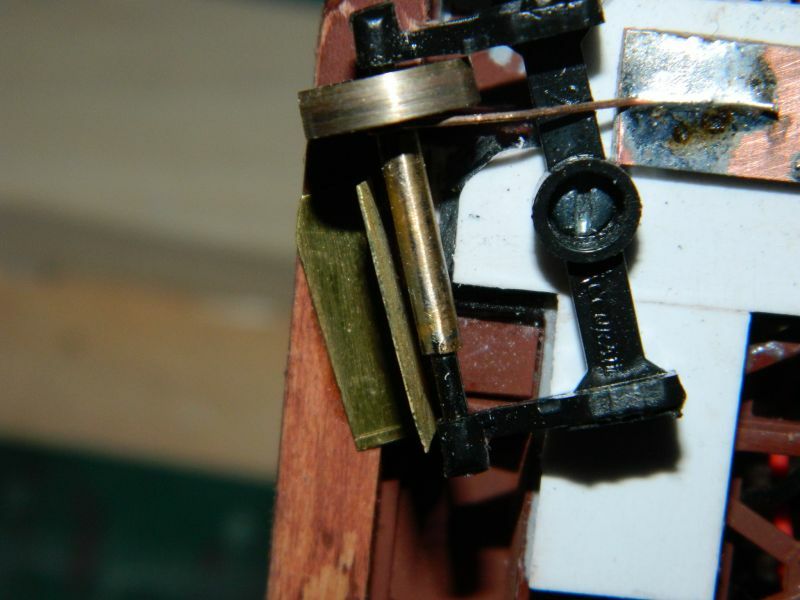 Electrical contacts, DCC. 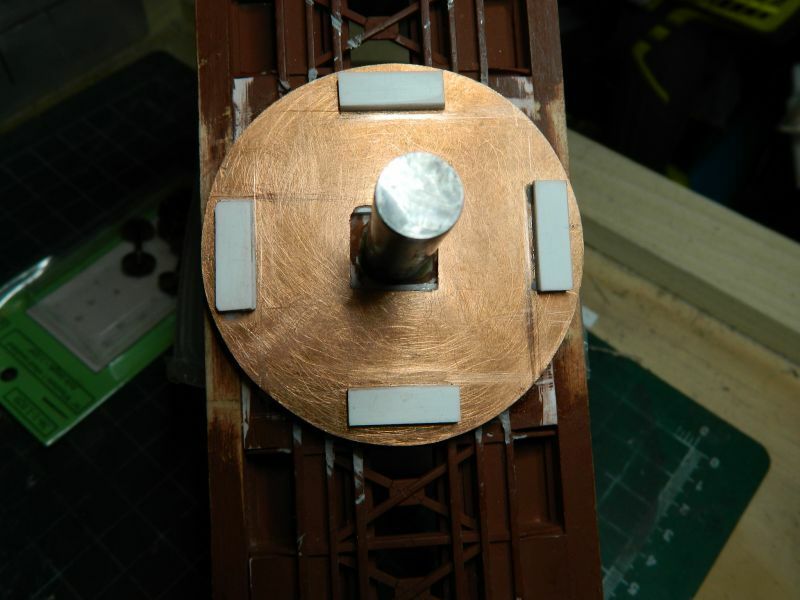 I used a piece of wide copper clad, and some 20 thou' phosphor bronze wire as wipers to connect the wheels to the turntable bridge feeders (black wires). Pick-up is at each end of the bridge feeding one rail. The other rail (red wires) will be fed by the copper disc and a couple of phosphor bronze wipers coming out of the floor of the well. I added a rail wiper (Z-shaped brass strip in the middle of the copper clad). Torque constrainers. Two small steel brackets were used to block torque-induced movement of the gearbox when running. The motor-gearbox sits between the brackets, I will be using some foam glued to the inside of the brackets to cushion the gearbox movement. I had to remove the brick styrene sheet from the floor of the well because of contact issues with the wheels and rail (I needed that additional 10 thou' of an inch!). Apart from that the wheels sit nicely on the rail, the Z-rail wipers work fine, and the bridge rotates freely. 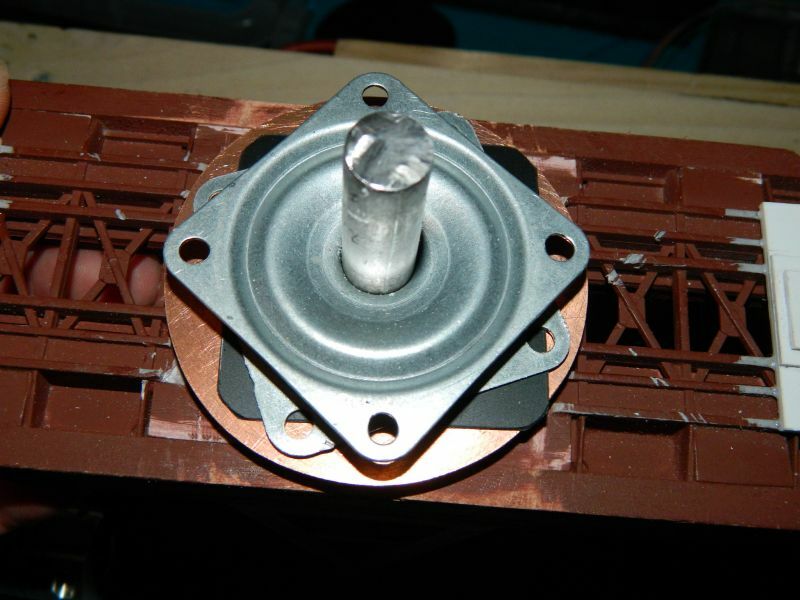 I also moved the black styrene insulator from the bearing to the underside of the copper disc. The wiper contacts for the copper disc are next on the list, then I can get on with the turnbuckles, wire stays and some NBWs. I also need to put some planking under the rail ties (sleepers) to hide the wiring, as well as on the inside of the bridge. Plus a couple of check rails. And the spider, musn't forget the spider..
Photo 1. 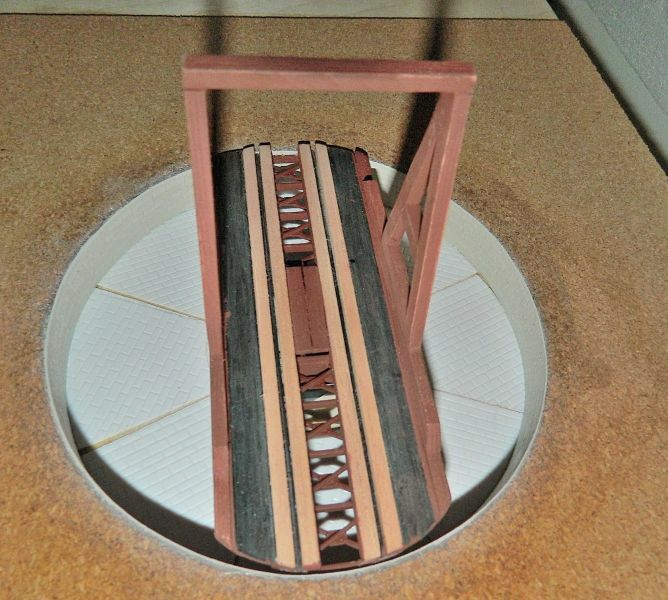 Turntable well with black styrene "concrete" rail base, rail and copper clad ties. Photo 2. Underneath of the bridge. Pretty busy here. 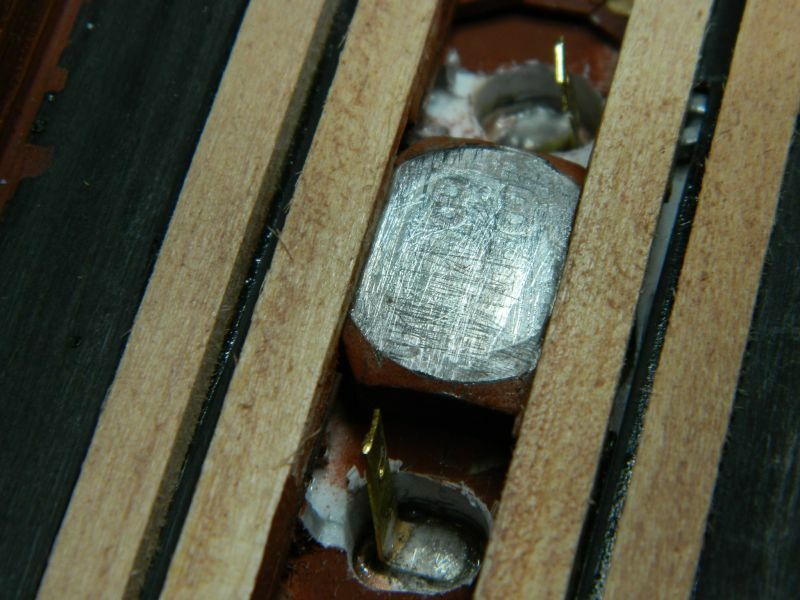 Note insulting styrene moved from the bearing to the disc. Flatter gluing surface, more stable. It will all look better with a coat of black paint. Photo 3. Close up of wiring. Left to right: Wheel wiper, feeder to one rail (black wire), Z-shoe for rail contact, other wheel wiper. Repeated at other end. Photo 4. Close up of turned wheel and wiper. Photo 5. Gearbox torque constraint brackets. Photo 6. Close up of a wheel riding on the rail. 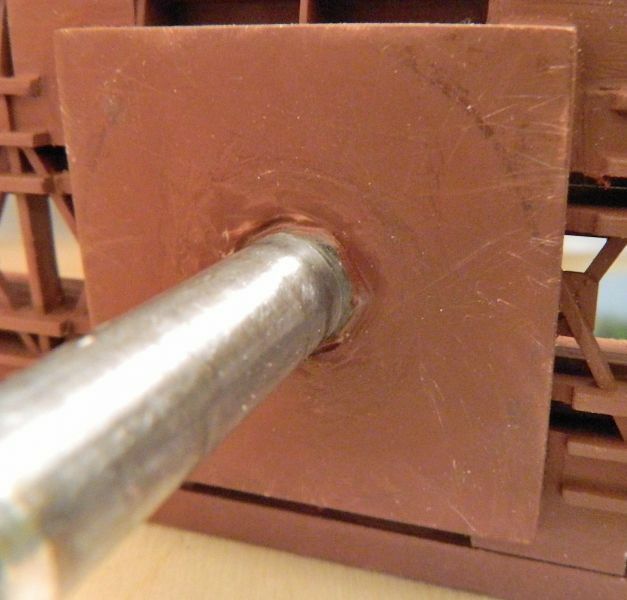 Removing the flange allows the wheel to sit on the rail and compensates for any out of round (it is slightly out at the rail joint/joiner, one of the issues with a small diameter). Photo 7. Wiring of the rails. 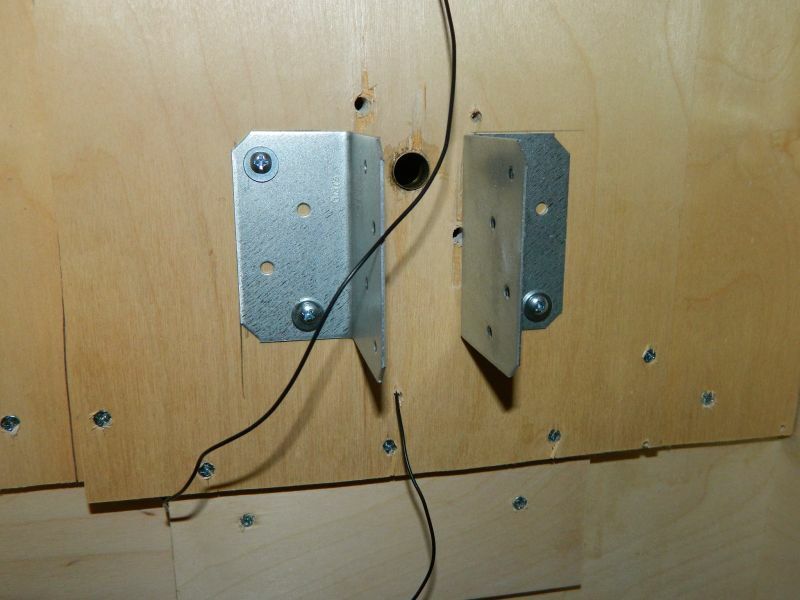 Each rail has feeders at both ends, the wires sit in the space between the wood frames. These will be covered by planking attached to the underside of the rail ties. Just in case I need access to the soldering/wires. Photo 8. 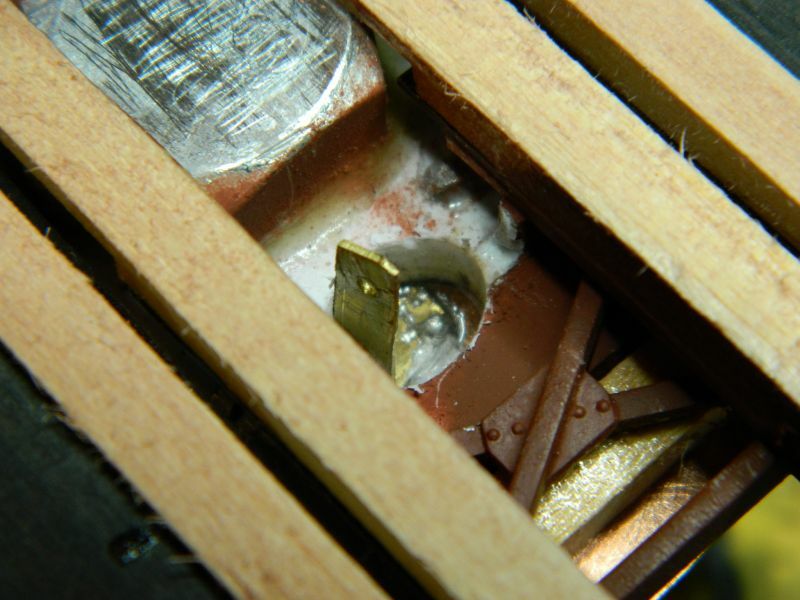 This shows the upper bearing plate located between the brackets and in contact with the styrene insulating sheet. Phew. Time for a cuppa and some digestives. Photo 9. The "layout". Cork underlay in place.